Happy New Year everyone! Can you believe it’s 2017?! I’m dragging my feet a little as I do with every new year. It’s change after all, I’m not overly fond of change. And it’s January, which equates to total and complete utter darkness in our home by the mountains in Alaska (okay, so we get 2 hours of direct sunlight when it isn’t cloudy). But all in all, I’m truly thankful. So thankful for the time we had with our amazing family and friends. At the start of the school break my ten year old wrapped his arms around me and said, “I’m so excited for Christmas, and family time!!! !” Melt my heart, and memory preserved. We enjoyed each other, laughed, ate rich food, watched excited boys, and played games. My boys are getting old enough that we can play more stimulating games than just Chutes and Ladders, and we laughed hard playing Guesstures! I am so thankful for 2016, it had ups and downs, but the blessings profoundly speak of a good, good Father. I thought I’d start off the new year with a review of last. One of our favorite past times around Christmas is to look through our photo albums I compile every year, and read the hilarious boy quotes recorded in the back. We laugh and smile and say “awwww, wasn’t he cute!” just remembering…. So, why not start off by remembering the best of last year and see what can inspire as we take off in another? 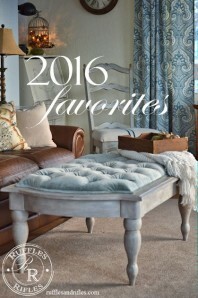 This year, the 2016 Favorites amounts to the top 11 posts. I know it’s odd. Just think of it as a top ten with an encore. 2016 started out with a faith post that I have gone back many times to preach back to myself. 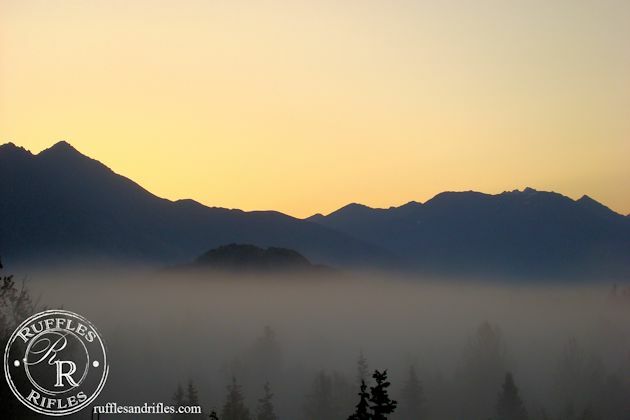 Waiting for the Dawn has depth and layers of meaning. It’s a post I wrote, longing for some answered prayer, not knowing if it would ever be answered, but having a genuine confidence that God had heard me, in the midst of my tears, and was comforted in peace even though I knew I may never see the fulfillment. It was a blessed way to start the New Year, and from the comments and shares I was blown away be how many other people it blessed. The answer to that post and a prayer prayed for decades was found in another faith post, one about a journey, and probably the most popular post of the year. 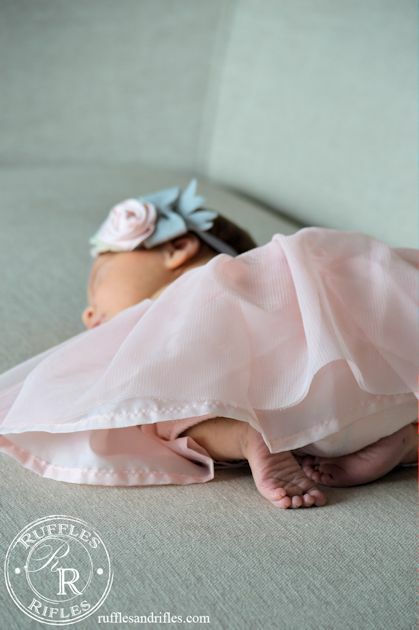 It’s a story about our daughter, When A Promise is Made True, is a testimony and a celebration about the faithfulness of God. There were many favorites in the sewing and original design category. I was so encouraged by the reaction from my Button Cuff Ruffle Raglan. It has become one of my staples in my everyday wear, I may just have to make another. 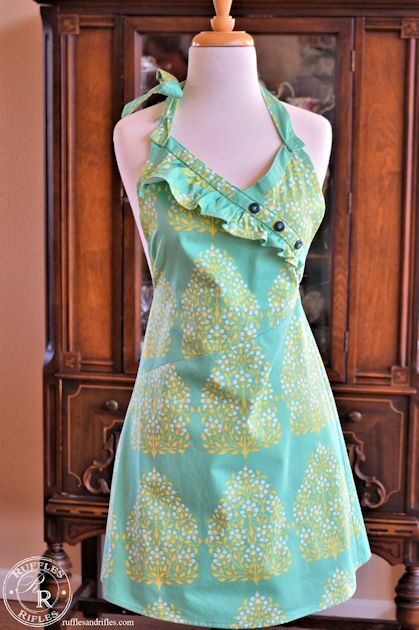 One of my original aprons received glowing attention as well. The Mabel Apron is one of my favorites, and one I hope to reproduce and/or produce a pattern in the future. 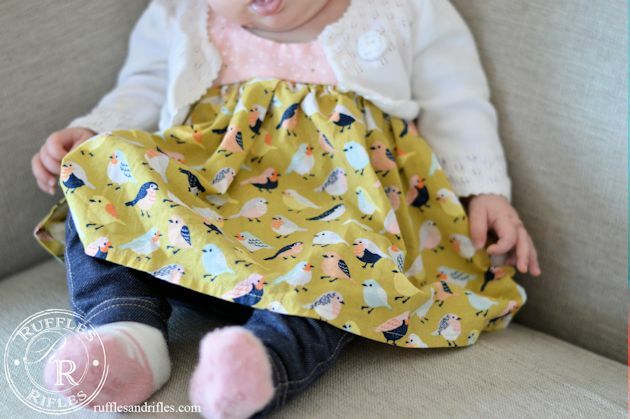 I completed my daughter’s first dress, Little Fall Birdie Dress when she was three months old. It was a Violette Field Threads pattern and turned out adorable if I do say so myself. Another sewing post that seemed to boast in attention was the Lace Embellished Hoodie. This is something I have thought about reproducing in the future as well. Truth be known, it was great lounge-wear for after I had my baby, both in the hospital and around the house. Even though I felt the typical body-thrashing and exhaustion, I had a pretty sweatshirt, and in some strange way, that makes a difference. Besides having our fifth child, we also moved houses in the spring, proving popularity in the new décor. You all were so kind when I shared our Our New Living Room post. I felt like I had an open house for people around the country and world, and appreciated the sweet responses. 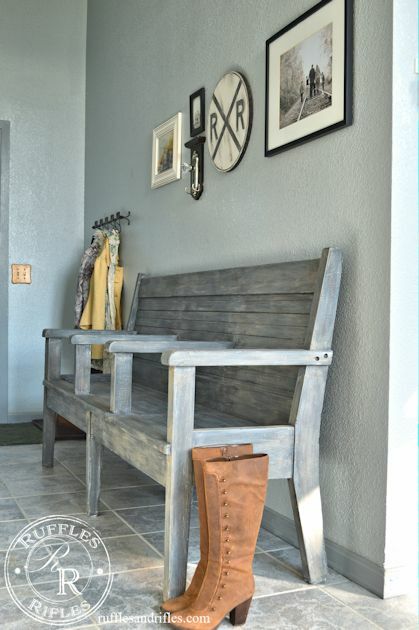 Our Vintage Railroad Bench and The Entryway Reveal got shared on a couple of other blogs. The crowning piece is the Vintage Railroad Bench from the Palmer Depot which I refurbished this summer. I did less in the furniture category this year, between being pregnant, moving and having a newborn, I seemed to have my hands full. However I did finish a few pieces. One was recovering the Glider Rocker Makeover. 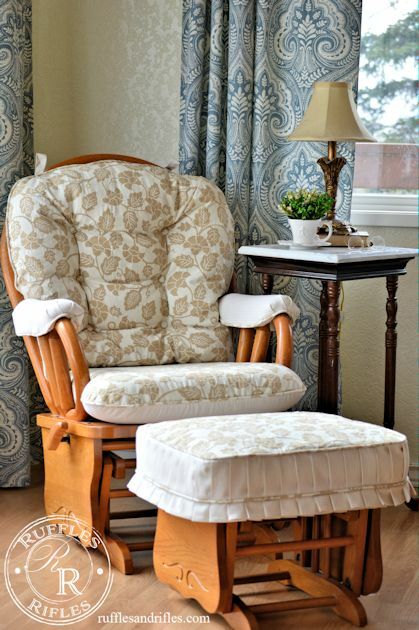 It is probably the prettiest glider rocker I have ever seen, and of course, it gets much use in the baby nursery on a daily basis. 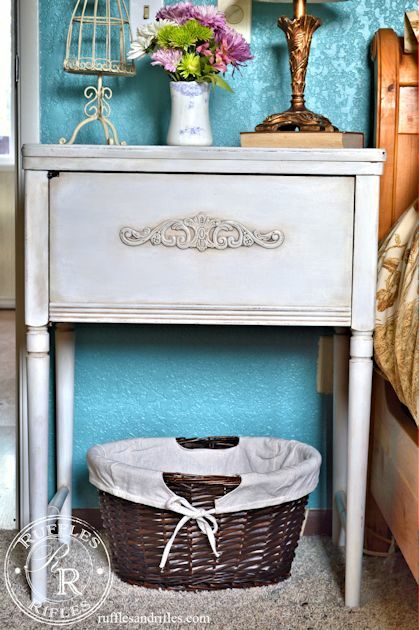 My greatest steal of the year has to be the $5 sewing cabinet I re-purposed that became my Vintage Sewing Cabinet Turned Nightstand. I really do love it. I still need to put a shelf on the inside, but it works great as a beautiful nightstand in our new room. And last but not least is the most popular post of all time so far on Of Ruffles and Rifles. I posted it in November of 2015, however, it got shared on countless blogs and Pinterest in January of 2016. 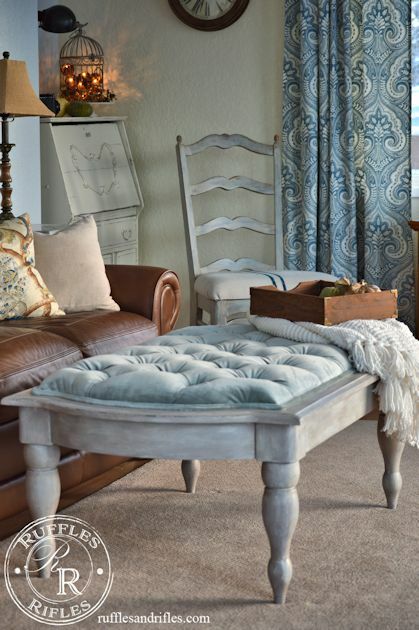 The Tufted Velvet Ottoman seems to be the all time favorite on my blog, and I have to say, in my house, I think it is my favorite piece of furniture as well. It is a statement piece that is full of practicality as well, (my feet like to be up). 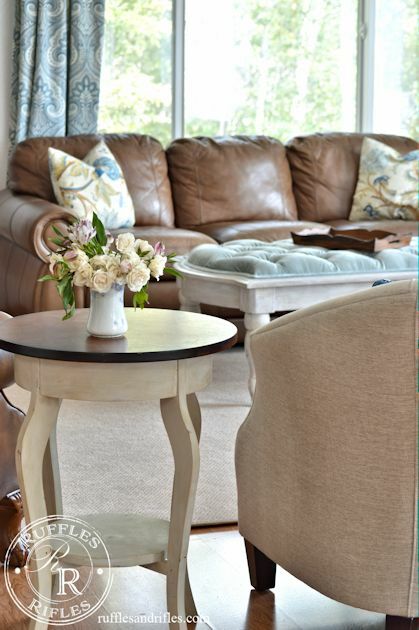 I also followed up with the promised tutorial for others to replicate the look in their own homes. Thank you again for following along everyone! I appreciate every single Like, Love, Pins and comments. I hope this year brings even more encouragement and inspiration.